The GRAMMY Museum is proud to present a special screening of the revealing documentary Genius Within: The Inner Life of Glenn Gould. 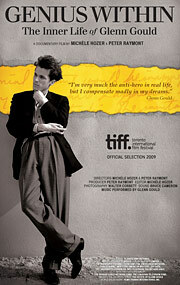 Written and directed by filmmakers Michèle Hozer and Peter Raymont, this film is a unique profile into the life of piano virtuoso Glenn Gould. Deemed a musical sensation in the late 1950's, Gould was a genuine Canadian icon who hit the heights of international acclaim. Being as well known for his mysterious lifestyle as he was his music, Gould has become the subject of numerous biographies and films since his death in 1982 at the age of 50. Genius Within: The Inner Life of Glenn Gould features high-profile interviews, never-before-seen footage, home movies, audio excerpts and even music composed by Gould himself. A post-screening question and answer discussion with the filmmakers, will immediately follow.